Classic appetizer recipes are the way to go when thinking about how to prepare asparagus. There is really no other factor to consider. 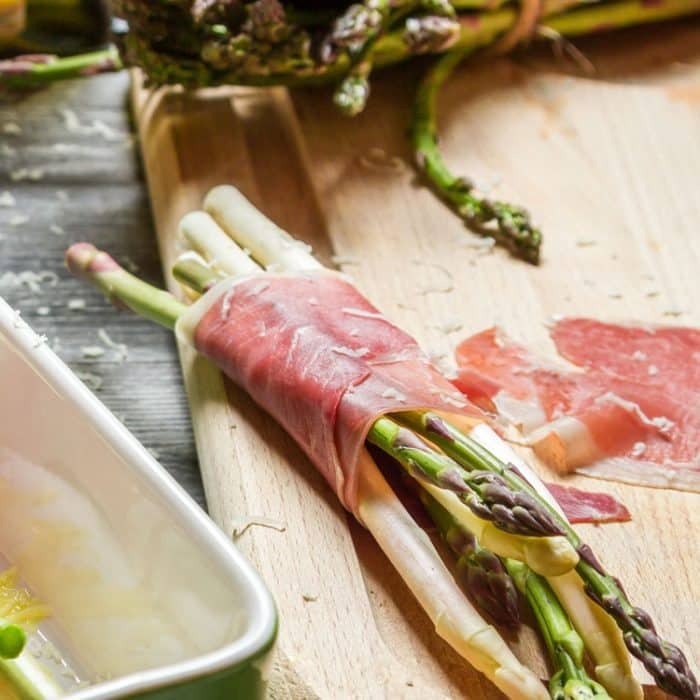 Asparagus wrapped in prosciutto–or bacon, if you don’t want to get that fancy–is the only way to go. If you’re cooking asparagus for any kind of gathering, it doesn’t matter if it is an appetizer or a side dish–you want it to be impressive and delicious. 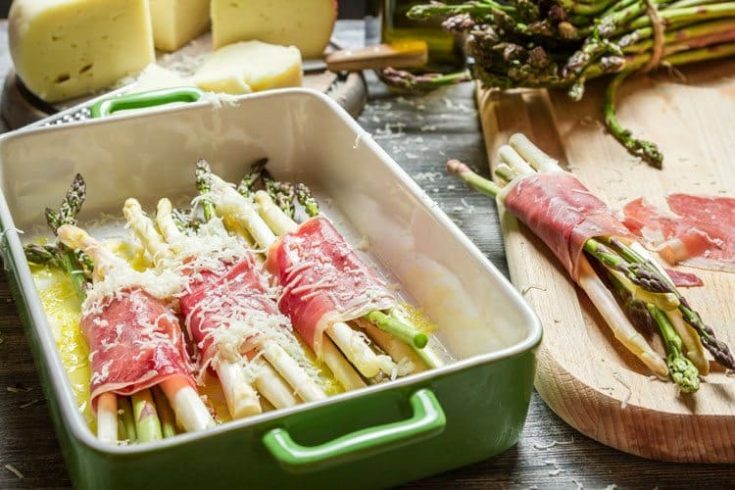 The meaty wrapping of prosciutto envelopes the asparagus stick in a flavorful cover that will be appreciated. Simple flavor combinations are often the most delicious. These elegant appetizers require just a few ingredients, but deliver incredible results in just a few minutes. For best results, have your prosciutto sliced in your grocer’s meat department (vs. buying pre-sliced packages). This will give you greater control over the thickness of each slice. If your slices are too thick, they will not remain neatly wrapped around the asparagus spears and your appetizers will taste too salty. Request very thin slices that do not fall apart when you handle them. Preheat broiler to high. Line a large, rimmed baking pan with parchment paper and set aside. Cut each strip of prosciutto in half lengthwise. Trim asparagus with kitchen shears. Wrap each trimmed asparagus spear with a strip of prosciutto, starting just below the tip and wrapping toward the bottom. 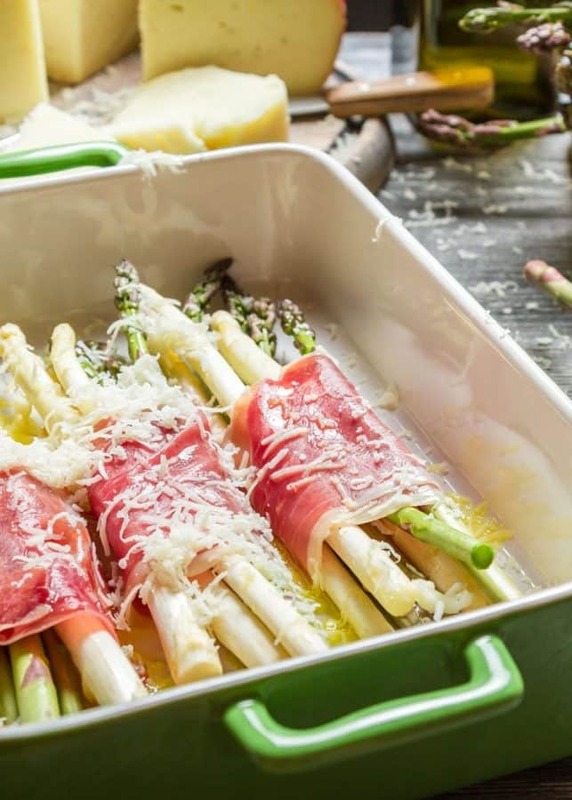 (Alternately, you can group a few asparagus stems together and wrap prosciutto around the middle as we did here and toss with shredded cheese). When finished, the entire spear should be covered, except for the tip. Arrange wrapped asparagus spears on lined baking sheet, leaving plenty of room between the spears. Use a second pan or work in batches, if necessary. Brush each spear with olive oil and season with freshly cracked black pepper, to taste. (Avoid adding excess salt because the prosciutto is naturally salty). Place baking pan with prepared spears under the broiler and cook for about 4-5 minutes. Remove pan from oven and carefully turn each spear before placing back under the broiler. Broil for another 2 or 3 minutes, or until the prosciutto is crispy and the asparagus is tender. Remove spears from baking sheet and place on a wire cooling rack to allow excess grease to drain. Dab lightly with a paper towel, if desired. Transfer spears to a serving tray and serve immediately.